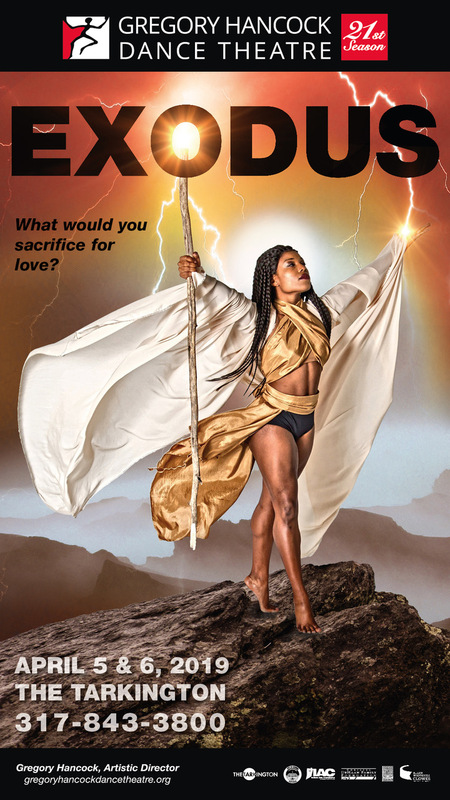 Gregory Hancock Dance Theatre presents EXODUS at The Tarkington at The Center for the Performing Arts, April 5-6, 2019, at 7pm. For tickets, click here. Gregory Hancock Dance Theatre, the resident professional dance company at The Center for the Performing Arts in Carmel, Indiana, will present the world premiere of Gregory Hancock’s newest work, EXODUS, this April. EXODUS is inspired by the book of Exodus, the second book of The Torah and Hebrew Bible (Old Testament), which tells the story of the Israelites’ departure from Egypt, led by the prophet Moses through the wilderness to the Promised Land. As with many of Mr. Hancock’s works, EXODUS will be a contemporary re-telling, set in “anytime” and “any place”, with the original plagues of Egypt being replaced by contemporary cautionary tales for the modern world. EXODUS will envelop the audience with visually stunning theatrical dance, costumes and lighting in synchronization with powerful and poignant, contemporary music. The talented cast will lead the audience through thematic stories of oppression, emigration and freedom, and will speak to human rights and equality that resonates globally even today. This inspiring and thought-provoking, epic contemporary ballet, will transport the audience into an emotional story of love and sacrifice. Through the creative storytelling of Mr. Hancock, EXODUS is sure to become another masterpiece in the GHDT repertoire.